I recently released a new mobile app "Subliminal Meditation PRO". 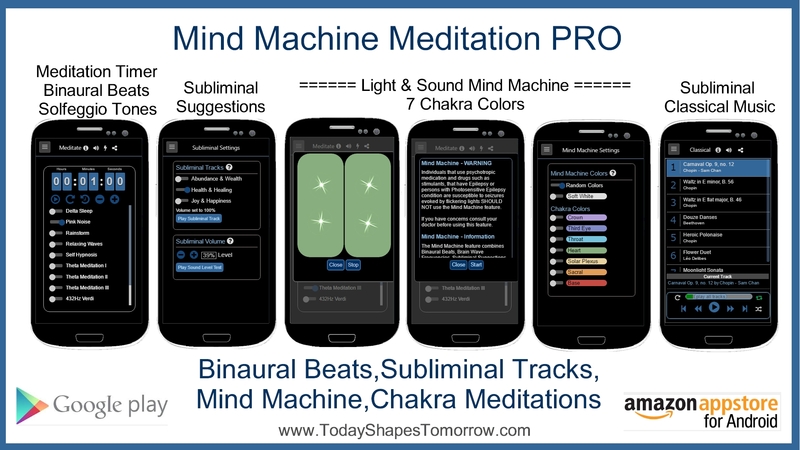 I wrote "The Ultimate Meditation App" that includes a Meditation Timer, Binaural Beats, Brain Wave Meditation, Mind Machine, Classical Music tracks, and features not found in retail mind machines such as the Seven Chakra Colors . Both the Meditation Tracks and the Classical Music Play will both play subliminal messages (you can listen to the entire subliminal message under settings). Get it on Google Play and Amazon. ☛ Theta Meditation: A Deep Mediation Track with Theta Waves using Binaural Beats in the 5Hz- 7Hz range that entrains your brain into a deep meditative state. Theta waves are associated with deep meditation and can help alleviate anxiety. ☛ Delta Sleep & Meditate: A Deep Sleep Track with Delta Waves using Binaural Beats in the 1Hz- 3.5Hz range that entrains your brain into a deep meditative state. Theta waves are associated with deep meditation and can help alleviate anxiety. ☛ Pink Noise: Softer than White Noise, Pink Noise is a great way to block outside noises and relax and meditate. A great sound to use to help babies sleep. ☛ Relaxing Waves: Relaxing waves great for general relaxation. ☛ Verdi 432Hz Meditation: 432Hz, known as Verdi’s ‘A’ is an alternative tuning that is mathematically * consistent with the universe. Music based on 432Hz transmits beneficial healing energy, because it is a pure tone of math fundamental to nature. ☛ 528Hz Solfeggio - DNA Repair Meditation: A Deep Mediation Solfeggio Track with Theta Waves using Binaural Beats in the 5Hz- 7Hz range that entrains your brain into a deep meditative state. ☛ 852Hz Solfeggio Intuition: A Deep Mediation Solfeggio Track with Theta Waves using Binaural Beats in the 5Hz- 7Hz range that entrains your brain into a deep meditative state. ☛ Solfeggio Frequency Meditations: The Solfeggio sound healing frequencies are believed to have many psychological, emotional, spiritual and physical healing benefits. 528hz is the exact sound frequency used by genetic scientists to repair broken DNA, and to which the genetic blueprint upon which all life is based! Depression, Insomnia, Autism, Chronic Pain and Fibromyalgia. Play subliminal tracks "underneath" Meditation Sessions & Classical Music. Listen to all the words of any of these Subliminal Tracks. You know exactly what is being said during a Subliminal Meditation Session. The volume of the Subliminal Track can be adjusted to an level below the conscious mind, or at full volume too for a non-subliminal session. The Voice Level setting allows you to set the sound level of the positive affirmations. The vocal track is played "underneath" or "behind" a meditation, nature, or music track on this app. Subliminal recordings will bypass, your conscious mind, going directly to your sub-conscious mind, where deep and lasting changes can be made in the area of thinking, emotions, health, wealth, and how we view life. Listen to Classical Music along with the subliminal track selected under settings. Listening to these classical subliminal tracks is a great way to benefit from subliminal audio during the day. The Music Player was very interesting to write. It is an HTML5 player that includes Saving last track, last track location, repeat song, random play. The Meditation Player is HTML5 audio as well, and it features looping, but not using the LOOP feature of HTML5 since it has gaps. This player uses two HTML5 players (actually 3 including the subliminal track) and cross-fades the tracks to make loop playing possible. This cross-fade looping technique works well for nature and ambient sounds, but with music you will hear a bit of a change in music tone as it cross-fades, but no gaps. More information on Google Play and on Today Shapes Tomorrow.